In his “Kongo in the Age of Empire, 1860-1913” Jelmer Vos provides an analysis of early colonization from an inside perspective in the Kongo Kingdom, in the North of present-day Angola. Kongo is not just any place in Africa on the verge of the colonial period; it is a kingdom that was Christianized as early as the sixteenth century, had maintained diplomatic relations with European states, and was still based on a Christian ideology when Portuguese conquerors encroached upon them in the mid-nineteenth century. European colonizers – and historians in their wake – believed that the Kongo Kingdom was then already in decline. Vos argues against this idea and instead demonstrates the centrality of the Kongo polity for the unfolding of European colonialism in West Central Africa. The subtitle “The Breakdown of a Moral Order” summarizes the book’s overall argument. 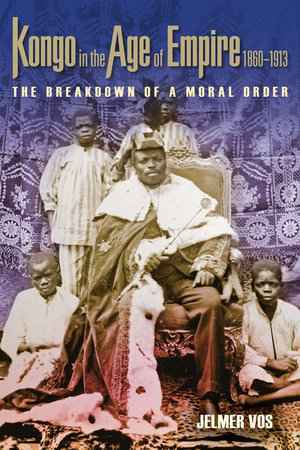 In 1913 an “anti-colonial” uprising aimed against the King of Kongo marked the existential crisis of a moral order, which Vos reconstructs for the preceding half century. He explains the breakdown of a kingdom characterized by connivance with Europeans, in which rebels blamed their own corrupt leaders for the effects of colonialism. Their aim was to restore the “moral order” upon which the society depended and for which the king was the ultimate responsible. Vos thereby counters the long-held understanding of the 1913 rebellion as a case of anti-colonial and proto-nationalist “primary resistance”. After an excellent introduction, in which the author summarizes the argument, sets the scene, relates to existing literature, reflects on sources, and makes a complex story accessible to the reader, the book consists of six chapters, a conclusion and an epilogue. The book also contains 38 pages of notes and 12 pages index. In chapter 1 Vos explains how the kingship worked, paying attention to its both political and sacral meaning. Christianity was primarily a royal political cult, believed to protect the community and to eradicate witchcraft. More than an actual governing function, the king was the highest judge and was responsible for maintaining the moral order. The economic chapter 2 is the most crucial one. The role of Kongo had always been part of some sort of caravan trade, hence the transition from slave trade to rubber production (and trade) was more a transformation than a disruption. The forced labour recruitment of the early twentieth century, however, marked a drastic breach. When in 1913 forced labour recruitment for the notorious chocolate islands of São Tomé and Príncipe coincided with the crash of wild rubber on the world market, the crisis was complete. This situation was understood as a failure from the part of the king, who had the responsibility to protect, but instead was involved in organizing the colonial labour recruitment and tax collection. This sacral and moral responsibility of the king was mirrored in how Christian missionaries were perceived (chapter 3). They were seen as either witches or healers, whose use lied in their capacity to protect (or not), in particular against recruitment. Chapter 4 adds the direct colonial dimension to the equation. The Portuguese increasingly attempted to intervene in Kongo affairs, drawing in colonial intermediaries, imposing coercive measures (labour recruitment and taxation), and altering succession procedures and protocol at the court. Parallel to this narrative of structural undermining of the Kongo moral order in chapters 2 to 4, Vos weaves through a social reading which underscores in chapter 2 the importance and prestige of porterage as opposed to plantation labour; in chapter 3 the changing gender relations, whereby women’s autonomy to attend Baptist school strengthened the erosion of chiefly male authority; and in chapter 4 the generational shift towards members of the elite families who grew up under colonial and mission influence and were – in analogy to digital natives today – literate natives. Chapter 5 is the turning point towards the 1913 uprising and breakdown of the moral order. Forced and low-paid contracts for plantation labour, violence by colonial soldiers and police agents, as well as the cash imperative in order to pay the colonial hut tax were the explosive cocktail that made the tensions built up over the previous chapters explode. Vos cleverly distinguishes between conclusion and epilogue. In the conclusion Vos sticks to the historical line of argument until 1913, whereas in the epilogue he goes on showing some continuities and consequences of the moral crisis in Kongo. In the epilogue he demonstrates how the revolt quickly developed into anti-colonial insurgency, yet insists in the conclusion that it was not one in the beginning. On top of the already mentioned use of Baptist and Catholic reports, the author uses as many contemporary sources (accounts) as possible. He also builds on state-of-the-art literature on the topic, much of which is 25 to 50 years old. This tells something about the timeliness of reviving this kind of research. The book as a whole is very well structured and signposted. Each chapter has an insightful introduction, an elaboration in the body of the chapter, and a summary and conclusions at the end. In combination with a clear and precise writing style, it is a pleasure to read the book from cover to cover, or to make use of the accessible structure in order to browse through it. Overall the author is very sensitive to all the ins and outs in Kongo and provides a detailed micro reconstruction inside São Salvador, but pays less attention to connections and comparisons beyond. He does take immediate neighbours into consideration and of course keeps an eye on Portuguese decisions in Luanda, but only goes beyond that when it comes to trade routes. Inward or outward migration, the mobility and connections of educated people and/or freed slaves, or comparisons with similar (or dissimilar) crises of colonial transition elsewhere, are at best mentioned, but not traced or taken up. Given the relevance of this research for a better understanding of how colonial incorporation, unequal power relations, and the breakdown of political, social and moral orders were locally produced, the book would have profited from a slightly wider scope. Geert Castryck: Rezension zu: Vos, Jelmer: Kongo in the Age of Empire, 1860–1913. The Breakdown of a Moral Order. Madison 2015 , in: Connections. A Journal for Historians and Area Specialists, 14.12.2018, <www.connections.clio-online.net/publicationreview/id/rezbuecher-28726>.